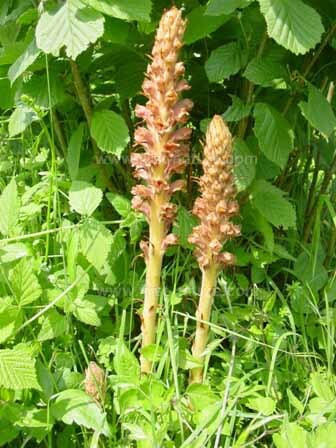 This very substantial broomrape often reaches a height of between 50 and 70cm and has a robust, thick stem and a large, densely-packed cylindrical infloresence. This distinctive broomrape is parasitic mainly on Centaurea scabiosa (Greater Knapweed) and sometimes on other Centaurea species. Very occasionally it uses members of the Asteraceae (Daisy) and Ranunculaceae (Buttercup) families as its hosts. Orobanche elatior grows on short and dry grassland, in thickets and meadows all with alkaline soils. This conspicuous wildflower blooms from the beginning of June to the end of July. Orobanche elatior grows in the southern part of the UK, through Europe to Central Asia and Northern India. 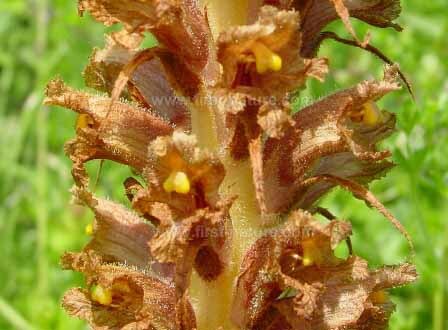 This broomrape also occurs in Sweden, Denmark, the Baltic States and Holland. It is very rare in the Mediterranean region but can be found in northern Spain, Italy and in southern Greece. The specimens shown on this page were photographed at Noar Hill, in Hampshire, in the first half of June.